FORGIVE THE FIRST-TIME visitor flying into New Mexico who looks down and mutters: “Sure looks gray, brown, and dry.” From the air, that may be the case. But when your feet touch ground, sage green, pine green, cholla green, and more shades appear. Put a spade into soil, add some compost, sprinkle with water, and you might even coax red, yellow, pink, and purple from trees, shrubs, vegetables, flowers, and succulents. Desert gardens provide challenges only worsened by our ongoing regional drought. But this isn’t Death Valley—it’s still the Land of Enchantment. Here are a few first steps to invite beauty into your yard. Born in 1981, the word xeriscape defines a type of low-water-use landscaping (xeros means dry in Greek). As it gained popularity, a few folks went overboard, coating their yards in nomaintenance gravel. Rocks play an important role in defining your yard, minimizing weeds, and making a star out of the plants you fall in love with, but they shouldn’t steal the show. Xeriscape appeals to minimalists. Done right, its spare number of well-chosen species thrive on mere sips of water. 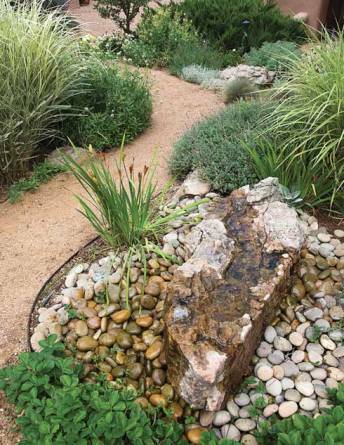 One of the best practitioners of the art is Albuquerque-based landscape designer Judith Phillips (judithphillipsdesignoasis.com). She’s written four books with tips on mapping out designs, choosing water-wise plants, and tending them. My favorites: Southwestern Landscaping with Native Plants (Museum of New Mexico Press, 1987) and New Mexico Gardener’s Guide (Cool Springs Press, 2005). Unless you’re lucky enough to live on an old floodplain, your soil has too much sand, too much clay, or too much caliche. For certain, the pH level is too alkaline; most plants seem to adore higher acid levels. To ascertain your soil’s profile and how it should be amended, collect a sample using a soil kit provided by your county’s Cooperative Extension Service, then mail it to their recommended lab at Colorado State University. Find its address, among others, at mynm.us/soillabs. (You’ll also want to bookmark aces.nmsu.edu/ aes/labs.html. This site contains an encyclopedia’s worth of advice on every agri-thing.) You can learn a lot on your own simply by spading around the yard and eyeballing your dirt. Chances are, it lacks organic matter and needs healthy helpings of aged manure, leaf mold, sawdust, straw, or store-bought compost. Dig it in at least as deep as a shovel head— or as much as your back muscles tolerate. Rule of Yard Work No. 1: The garden will bend to your abilities faster than your abilities will rise to its demands. Go on lots of hikes and study what you see. What kinds of plants bask in the sun? Which seek shelter in the shade? Do certain plants cluster around boulders? Mimic those cues in your yard and you’re one step closer to practicing permaculture—a type of ecological design that works with nature rather than against it. Good sources for purchasing native plants include Plants of the Southwest, in Albuquerque and Santa Fe, and the Santa Ana Pueblo’s Native Plant Nursery. New Mexico’s micro-zones can outsmart your plans. Plants that thrive even a few miles away may wither in your yard. Visit the neighbors to see what they have blooming. Walk around the block. Take a garden tour. Ask everyone what they did right. And wrong. County Cooperative Extension Services throughout the state offer Master Gardener trainings every year, and often the graduates hold one-day workshops on topics like pruning or dealing with pests. Check them out online or give your county’s office a jingle. Besides Judith Phillips’ books, good titles include the Sunset Western Garden Book (Oxmoor House, 2007), the basic bible for general reference; Down to Earth: A Gardener’s Guide to the Albuquerque Area, by Albuquerque Master Gardeners; and Baker H. Morrow’s Best Plants for New Mexico Gardens and Landscapes (University of New Mexico Press, 1995). Morrow’s book separates the state into regions, a handy tool given the vast differences in altitude. High Country Gardens puts its years of wisdom online (highcountrygardens.com). In time, you may own a wheelbarrow, chain saw, post-hole digger, pitchfork, hoe, edger, three kinds of pruners, various spades, and more. Until then, keep it simple. You can’t do a thing without a pair of gloves and a big strong shovel. If your soil contains clay or caliche, invest in a pickax. A heavy bow rake moves soil; a leaf rake sweeps the top clean. For hand tools, a trowel and pruners will go a long way. Add a bottle of ibuprofen to soothe the muscles all that work strains. I’ve grown tomatoes, kale, herbs, fennel, and chile in patio pots. Santa Fe–based Grow Y’Own sells raised garden beds with hooped tops for creating year-round mini-greenhouses. The aluminum watering troughs sold at feed stores make cool pots with a sleek-but-stillcountry style. Containers offer complete control over soil, are easy to water, eliminate stoop labor, and dissuade rabbits. Drainage can be a problem, so make sure the bottom of whatever you use has holes. The deeper the container, the more soil you’ll need. Consider starting with a layer of rocks. The oft-trumpeted Styrofoam-peanut layer sounds like lightweight fun until you need to tend the soil. Rule of Yard Work No. 2: In a yard or a container, you will need to tend the soil for the rest of your garden’s life. Desert sun and spring winds strip moisture from that modified soil. A layer of mulch slows down evaporation and suppresses weeds. A few inches of organic material, rocks, tumbled glass, or even shredded rubber will work. Organic choices include pine needles, bark, pecan shells, leaves, straw, and grass clippings. Once they decompose, you can work them into the soil. Check to see if your local landfill composts green waste and offers it for sale by the truckload. Rule of Yard Work No. 3: Things go wrong. Temperatures soar, hail falls, rabbits nibble, and the lowly bark beetle lays waste to entire forests. Why bother? Like a lot of things in life, gardening is more about the process than the goal. Learn some science. Play with design principles. Spend hours outdoors working your mind, body, and spirit as you till the soil and baby the tender sprouts. Wrap your heart around the act of gardening and the actual garden will follow, beautiful and imperfect, together as one. Kate Nelson lives and gardens in Placitas.